I came to learn of Anthony Shore as I continued to investigate the case of Preston Hughes after his wrongful execution. I learned then that Anthony Shore lived but one mile from where Shandra Charles and Marcell Taylor were murdered. I learned also that Anthony Shore's first acknowledged victim was murdered two years to the day before the double murder for which Preston Hughes was executed. The two coincidences are troubling. Because Charles and Taylor were black and Shore's acknowledged victims were either white or Hispanic, and because Charles and Taylor were stabbed in the throat rather than strangled, I am not yet prepared to argue that Shore murdered them. That may change by the end of this series. However, as I studied the acknowledged victims of Anthony Shore, it occurred to me that Melissa Trotter may have been an unacknowledged victim. In this series, I intend to raise the possibility that Melissa Trotter was but one of many unacknowledged victims of Anthony Allen Shore. I'll introduce the series with an overview of serial killers, their characteristics, and their behavior. The overview will help you understand where Shore falls within the spectrum of serial killers. That will be helpful when deciding whether or not various unsolved murders in the Houston area belong to Shore. I restrict the discussion in this post to serial killers in the United States. Much, but certainly not all, of the information presented in this overview is from a set of student notes by Dr. Mike Aamodt of Radford University. 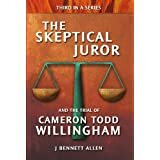 John Douglas, a former Chief of the FBI's Elite Serial Crime Unit and author of Mind Hunter says, "A very conservative estimate is that there are between 35-50 active serial killers in the United States" at any given time. Dr. Aamodt provides the following chart. Dr. Aamodt seems to have taken his data from a database of known serial killers. The chart would then reflect primarily serial killers who have been captured or at least identified. 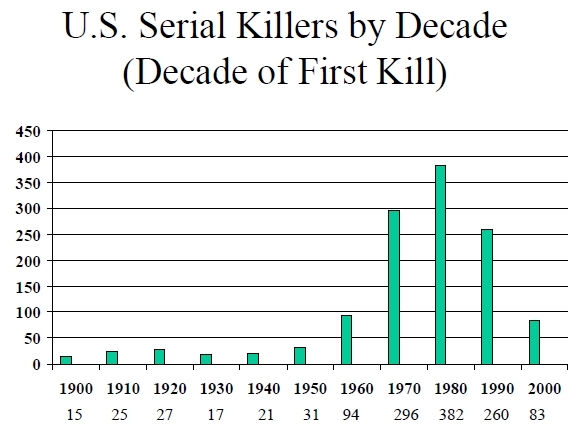 My interpretation is that the Aamodt chart reflects the number of serial killers no longer active, and John Douglas' number reflects the number of serial killers active at any time. Let's do a little math to estimate the number of serial killers that might be operating in the Houston metropolitan. We'll divide the current population of Houston metro (6,051,363) by the current population of the United States (and I mean current, at 315,253,444) to learn that 2% of the U.S population resides in the Houston metro area. Now, assuming serial killers are evenly distributed among the population, and assuming 50 serial killers are operating nationwide, we can calculate that one serial killer is operating in the Houston area. (50 x 2% = 50 x 0.02 = 1) That's an average. Given that it's statistically unlikely one serial killer would always stop just as another begins, it's much more likely that there will be zero, one, or two (perhaps three) serial killers operating the area at any time. A serial killer is a type of multiple murderer. The other types of multiple murderers are spree killers and mass murderers. A mass murderer, according to the FBI, is someone who kills 3 or more people in the same attack at a single site. Eric Harris and Dylan Klebold are mass murderers. Together, they killed 12 students and one teacher during the Columbine High School massacre. A serial killer is someone who kills 2 or more people with a "cooling off" period in between the killings. Anthony Shore is a serial killer, having killed at least 4 people in events separated by months or years. A spree killer is someone who kills 2 or more people in different geographic locations without a "cooling off" period. By this definition, Anders Behring Brejvik of Sweden is a spree killer. On the same day, he killed 8 people by bombing government buildings, and 69 people at a Worker's Youth League camp. I assume in their estimates, Dr. Aamodt and John Carpenter are using the definition of a serial killer as described above. 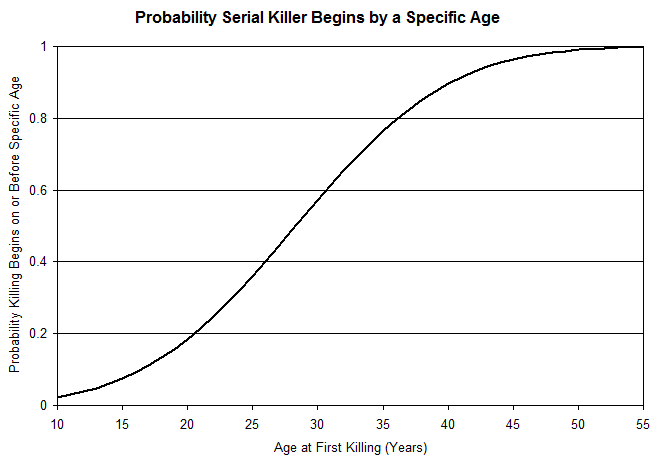 Based on his database of 1,739 serial killers, Dr. Aamodt calculates the mean age for the first kill at 29 years old. He references two other researchers who put the age at 28.5 and 31 years old. 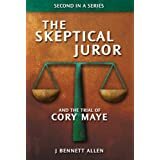 Aamodt adds that the youngest was Robert Dale Segee (9 years old when he first killed) and the oldest was Ray Copeland (72 years old when he first killed). I'm dissatisfied with Aamodt's summary. Here's why. I now suspect Anthony Allen Shore killed young women soon after he returned to the Houston area in January, 1981. His first possible victim may have been Susan Eads. (I'll explain more as this series continues.) She was killed on August 31, 1983. Shore was born on June 25, 1962. He would have been 21 years old at the time of her murder. I want to know how likely or unlikely it would have been for him to start killing at age 21. I can't get that information from Dr. Aamodt's student notes. Fortunately, Dr. Aamodt comes through in another presentation. There he gives the median age at first kill as 28.8 years old and provides a standard deviation of 9.27 years. That's great. That allows me to build a binomial distribution and get some sense of how likely or unlikely it would be for a serial killer to begin killing as young as 21. Okay, I'm back. Here we go. Click to enlarge. Shore's first acknowledged killing was Laura Tremblay. That occurred on September 26, 1986. (I never have to look that date up. It was two years to the day before someone other than Preston Hughes killed Shandra Charles and Marcell Taylor.) Shore was three months past his 24th birthday. 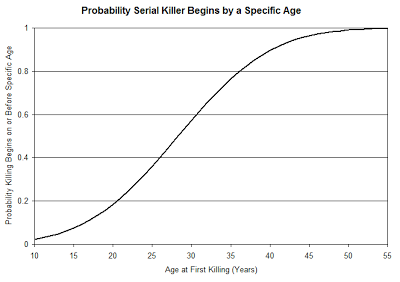 Using similar assumptions and math as above, there is a 32% chance that a serial killer will make his first kill when he is 24 years or younger. No matter how you cut it, Anthony Shore started at a younger age than most serial killers. 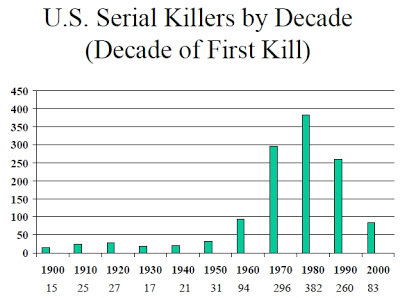 There is a surprisingly large range of serial killers. Once again, Dr. Aamodt summarizes the issue nicely, in a single chart. I've added the ellipse to show into which category Anthony Shore falls. Because Shore searches for a specific type of victim (young girls with long hair in need of a ride), and because he is motivated by sexual impulses, he is classified as an organized lust killer. 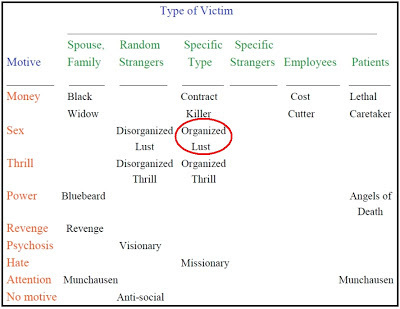 I turn to Wikipedia for the distinction between organized and disorganized serial killers. Organized nonsocial offenders usually have above average intelligence, with a mean IQ of 113. They often plan their crimes quite methodically, usually abducting victims, killing them in one place and disposing of them in another. 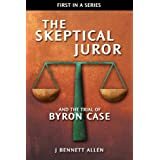 They often lure the victims with ploys appealing to their sense of sympathy. For example, Ted Bundy would put his arm in a fake plaster cast and ask women to help him carry something to his car, where he would beat them unconscious with a tire iron, and carry them away. Others specifically target prostitutes, who are likely to go voluntarily with a stranger. They maintain a high degree of control over the crime scene, and usually have a solid knowledge of forensic science that enables them to cover their tracks, such as burying the body or weighing it down and sinking it in a river. They follow their crimes in the news media carefully and often take pride in their actions, as if it were all a grand project. The organized killer is usually socially adequate, has friends and lovers, and sometimes even a spouse and children. They are the type who, when/if captured, are most likely to be described by acquaintances as kind and unlikely to hurt anyone. Bundy and John Wayne Gacy are examples of organized serial killers. 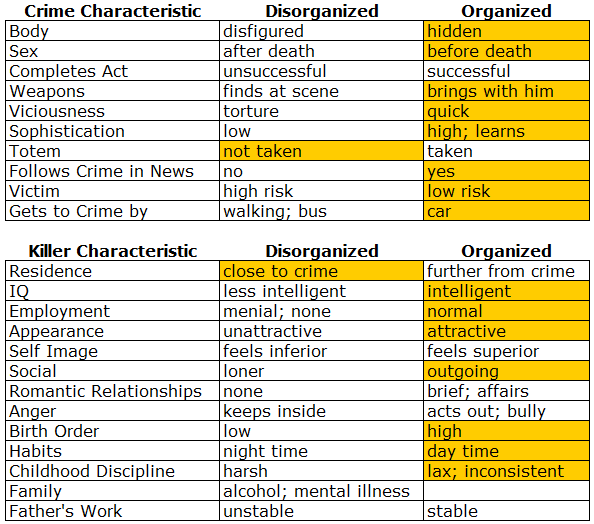 Disorganized serial killers, on the other hand, often have average to below average intelligence, with a mean IQ of 92.5. They are usually far more impulsive, the murders are often done with a random weapon available at the time, and usually no attempt is made to hide the body. They are likely to be unemployed, a loner, or both, with very few friends. They often turn out to have a history of mental illness, and their modus operandi (M.O.) or lack thereof is often marked by excessive violence and sometimes necrophilia and/or sexual violence. 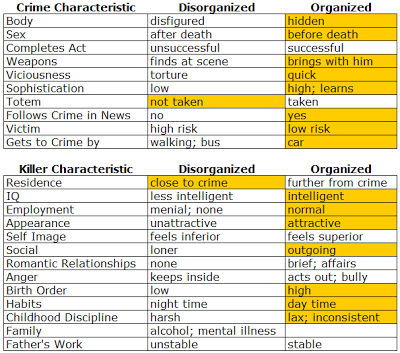 I've recreated a few tables from Dr. Aamodt's notes that nicely summarize the differences between organized and disorganized serial killers. I've highlighted those characteristics that fit Shore in yellow. Two items jump out immediately. First, Shore did not apparently collect totems from his crimes. That's an unusual characteristic for someone who has so many "organized" characteristics. I understand, however, that the police discovered that Shore kept a stash of pornographic magazines in a rented storage locker. Perhaps Shore did keep totems from his crimes, including totems from his unacknowledged crimes, but the police failed to recognize them as such. It would be interesting to compare the items found in that storage locker against the possessions of all of Shore's possible victims. Second, Shore selected his acknowledged victims close to home. That's also an unusual characteristic for an "organized" serial killer such as Shore. Perhaps though, he killed others further from home. We'll consider that possibility as we continue to explore the many possible victims of Anthony Allen Shore. If you want to share more information with me about your suspicions, please email me. Beyond that, I offer my thoughts and best wishes.